Just because your job requires you to be enemies, doesn’t mean you can’t be friends on the side. Great to be back. I’ve been waiting forever to blog about this. So let’s begin. First: the plot. (I’m going into alot of detail here.) Our film starts with magic. Elmer hunting for “wabbits.” Daffy is of course changing the duck season signs to rabbit season. When Elmer shows up, Bugs does the classic swithc line and a quick montage of Daffy’s beak being blow off ensues. Daffy suddenly interupts. He is reading a script. The script for this movie. He tells the Warner Brothers that this is a terrible idea for a movie. Bugs appears. He drops a few names. (I’m pretty sure it’s a tribute to Bob Clampett, Chuck Jones, and Mel Blanc.) He agrees to be out of the movie, but the vice president of comdey, Kate Hottan, (Jenna Elfman) says it can’t work without Bugs. Daffy tells him to choose between them. He is promptly fired. (Look in the background. 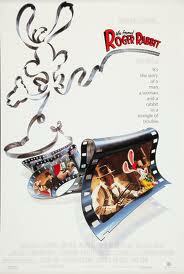 Poster’s for “Rabbit of Seville”, “Hair Raising Hare”, and “Baseball Bugs.”) Elsewhere at the studio, (see this is already an improvment of Space Jam. It goes the “Roger Rabbit” route and makes toons, real citizens. 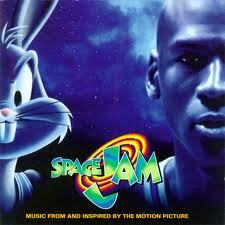 I love Space Jam, but even I can tell it’s not perfect.) A man named D.J. (Brendan Fraser) is auditioning for the role of a stuntman. (The crusher is one of two people judging his performance) He doesn’t get the job. We learn that his father, Damien, is the most popular star at the studio. D.J.’s main job is a security guard. While washing a car, he sees Kate, escorting Daffy out. Bugs is following close behind. She tells D.J. to get rid of Daffy. While they chat Bugs switches places with Daffy and Daffy escapes. D.J. goes after him in an amusing chase sequence. Daffy runs onto the set of a Batman movie and tries to steal th Batmobile. D.J. gets him but Daffy already turned the car on and it crashes into the water tower and floods the studio. (Hope the Warner’s weren’t home) Only 2003 and Bugs already references “Finding Nemo.” (Which came out earlier in the year) D.J. is fired (despite the fact it wasn’t his fault) Kate and Bugs meanwhile are at lunch. Interesting cameos here. Porky and Speedy are currently out of work due to political correctness. (Speedy i can understand. Not Porky. And unfunny? HOW DARE YOU! Heads will roll.) Shaggy and Scooby are also there telling Matthew Lillard they weren’t impressed with his live action role. (One of my few problems with the movie. It’s a good joke, but why are they there? 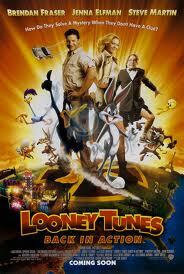 It’s called Looney Tunes Back in Action. I know that WB owns them, but they are not part of the group. If you have to do this, go all out. Put in other Warner owned characters. Animaniacs. Teen Titans. The possibilities are endless) Bugs and Kate are discussing the movie. Behind them Ralph and Sam are eating lunch together. Sam beats Ralph up for attempting to eat a sheep. Kate tells Bugs that he needs a female co-star. (Background images: pictures of Hugo the abominable snoman (“The Abominable Snow Rabbit”) Buddy, the Gremlin, (Falling Hare) and I think Chuck Jones. There’s also a poster for “Singing in the Rain” starring Bugs Daffy and Lola. Her only appearance in the film.) Bugs tells her that he plays females. This causes Mighigan J. Frog behind him to start singing. Kate says it’s creepy, no longer funny. Wrong, woman. Bugs is one of the few guys who can do not and not look gay. (The worker takes Mighigan again) D.J. gets home and it turns out he lives next door to Granny, Tweety, and Sylvester. (Yes, she’s still June Foray) Granny is trimming her hedges and accidentally cuts off a sneaking Sylvester’s tal. Going inside, D.J. finds that Daffy followed him home. Daffy learns who his father is and believes he’s a real spy. D.J. hears a ringing from his remote and turns on a recording of his father telling him to go looking for a diamond called the Blue Monkey. He also tells him to locate someone named Dusty Tails in Las Vegas. Daffy volunteers to come along. (Because of the diamond.) They take a gremlin car that Daffy is convinced is a spy car. (The “Gremlins” theme plays) They drive off, and we learn that there really was a spy car hidden in the garage. At the studio, it’s pretty clear that the movie needs Daffy to work. Elmer actually ends up shooting him. Despite the fact that they fired Daffy, they blame Kate. If she wants to keep her job, she needs to get him back by Monday. Daffy meanwhile is constantly being thrown out of the car. He mocks D.J. for being a security guard and D.J. tells him he’s really a stunt man, and did most of Brendan Fraser’s stunts. (laugh) Bugs calls and tells Daffy that he can get his job back. Daffy is not interested and mentions that he’s off to vegas. Their conversation is being eavesdropped on by the Acme Corp. A man named Bob Smith tells the chair man of this news. The chairman (that’s his name) has many Vice Presidents. Including ones for Rhetorical question, Child Labor, and Bad Ideas. (Steve Martin is hysterical here) It’s revealed that he has captured Damian and shows his people via camera. (Accidentally getting “I Love to Singa”) He explains that soon he will be in total control of the world. (He also hits on one of his employees, Mary. Yes this is important) He also tells his men to kill anyone who dares get in the way. Good morning! Sam Sheepdog has just woken up and is on his way to work. On the way he greets his good pal, Ralph Wolf. (Named after one of the storyboarders at the time) They walk together and wish each other luck and take up their positions. Sam begins to guard, Ralph prepares to steal (wool). He crawls under a shep and carries it away, only to run into Sam, who pounds him. Digging undergound, Ralph tries a lassoe and unknowingly catches Sam. He builds a TNT bridge and taunts Sam. Sam crosses and Ralph goes back the other way, lighting the fuse. Sam is already at the other end and demands the sheep Ralph has. Ralph gives and goes back to put out the fuse, unaware that Sam lit his end too. Ralph tries a seesaw to fling Sam away, but the dog is too heavey and Ralph flies into his arms. Sam flings Ralph. Finally, Ralph gets a giant rubber band, attaches it to two boulders, and pulls back, aiming at Sam. Instead, the boulders come loose and fly after Ralph, who runs between a narrow cliff. The rocks catch on the sides and threaten to launch Ralph away. Ralph grabs onto a tree and the rocks finally squeeze through the opening, and Ralph ends up against another cliff, with all the debris smashing into him. Later as the two pals walk home, (Ralph with a sling and black eye) Sam tells him to take the day off. Ralph’s been working too hard and he can handle both jobs. Ralph thanks his friend and stumbles home. This is the first appearance of Ralph and Sam and it shows it. Sam is erronosly called ralph and the real ralph looks less like a coyote and more like a starving animal. It starts with Sam going to work he greets Fred sheepdog and they switch places for the day. Ralph shows up and plans to get the sheep he sets the timeclock ahead and this works. Until Sam sees the village clock an runs back to the field. (Another thing is Ralph usually gets his prey, he just does not get to eat it) 3 more scenes deserve mention. Ralph digs under the ground to get the sheep but he gets greedy and takes them all. Sam sees this and rushes down. The wolf grabs him. POW! Ralph uses a rope swing to swing down and get a sheep he grabs sam. Finally Sam quits for the day and Fred greets him. Sam starts pounding him and we see its really ralph in disguise. The real fred comes up and keeps pounding Ralph.